Oh, how I wanted to like The Wolfman. I was so excited when I saw the trailer, I even ran a post suggesting it looked more exciting than Avatar (I totally deserve to get the boot for that one). Not only does it star one of my favorite actors, Benicio Del Toro. Not only does its imagery evoke the expressionistic chiaroscuro scenes of the old Universal horror flicks AND the repressed (at least some of the time) eroticism of the Hammer horror movies. 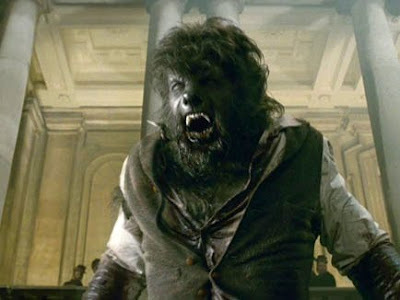 It is also the return of one of my favorite cinematic monsters, the werewolf. There is something tragic about the werewolf, a man (or even woman as in 2000's great Ginger Snaps ) whose monstrous nature is a curse inflicted rather than a an inborn evil. Generally, this puts the viewer in the position of rooting for his human persona while recognizing the danger of his animalistic one. Rarely though, does it force one to actively root against the wolf monster he becomes the way one would against Jigsaw or any other inherently evil killer. Who can really hate an animal for simply acting true to their bestial nature? Some actors can deliver the conflicted nature of such a creature, from narrowly talented ones like Lon Chaney, Jr. in the legendary original 1941 iteration of this film to the far more dynamic Oliver Reed in my personal favorite, The Curse of the Werewolf (1961). So imagine my surprise when the usually dependable Del Toro fails to pull this off. His Lawrence Talbot, haunted as he says he is, sleepwalks through the otherwise operatic Wolfman, lost in Method-inspired underplaying while his stage-inspired British supporting players steal the film out from under him. Anthony Hopkins isn't even working hard at it. His performance as Talbot's father, Sir John, is subdued enough to be nearly as somnambulistic as Del Toro's. But Hopkins can do more with an unexpected voice modulation than other actors can, even Del Toro, whose portrayal of the monster demonstrates he can release his inner beast with gusto when necessary, Rick Baker's fantastic makeup be damned. A wild romp through a Victorian London right out of the recent Sherlock Holmes allows Del Toro to chew more than the scenery. Sherlock Holmes also serves as a key to decipher what went wrong with The Wolfman. Editor extraordinaire Walter Murch seems to have been brought on to save this movie. He seems to have been inspired by Guy Ritchie's stop-start, slow-mo-then-overcranked editing style since it enlivens the contemporaneous setting of the Holmes film. But Murch's hyper-stylized editing does nothing to erase the picture's flaws. This movie has been delayed for a year, and quite honestly it shows. Director Joe Johnston (October Sky ) may be more to blame for Del Toro's failings than the actor himself. The performance of his leading actor seen in relief to that of the rest of the cast indicates Johnston leaving Del Toro to his own devices. The film is overscored by Danny Elfman (after almost being fired and having his compositions deleted in favor of someone else's), his orchestration a virtual rip-off of Wojciech Kilar's seminal music for Bram Stoker's Dracula (1992). Despite being lit quite beautifully by Shelly Johnson, the movie's tendency to fall back on medium close-ups betrays his roots in the televison world, minimizing any dynamism from the disjointed shot selections. The problem is Holmes' editing style doesn't work in this Gothic horror film, where shots need to linger long enough to establish a sense of atmosphere and heighten the tension. Strangely enough, The Wolfman simply moves too fast, sacrificing mystery to make sure all of the money spent on gore, CGI, and art direction is seen on the screen. Sadly, I'll have to wait a bit longer to get an effective movie worthy of this classic monster. The Wolfman's growl is indifferent to its bite. I came into this one a lot like you - thinking that all the bad reviews were people who were expecting too much. I was hellbent on just having fun and watching a werewolf cause havoc. I think it's especially sad when one sets their expectations pretty low and still can't have them met. Tony - I came into this one without big expectations - and without being a big fan of Wolfman lore - though I've always loved the Wolfman's part in Abbott and Costello Meet Frankenstein. Thus, I rather enjoyed this modest but entertaining film. Yes, the editing was very fast - but I think the fast pace worked well for a movie that didn't have much plot. I enjoyed the performances - I didn't think Del Toro was bad - and the art direction and lighting really created a memorable Gothic atmosphere. I agree with you about the music - I thought it sounded familiar - and the film could have done without the sudden starts accentuated by pumped sound effects - a ridiculous element of the modern horror movie. Though it may not sound like it, Hokahey, I actually came into this one much like Mad Hatter did. I had incredibly low expectations with the chances that I'd give this one a pass because I was just so happy to see a werewolf movie. Didn't you find the movie muddled and uneven? The fast pace and overuse of a musical score highlights the thinness of the plot rather than hides it. As for Del Toro, I don't find him bad per se. It just seems like he's acting in a whole other film. He is in MASTERPIECE THEATER while everyone else is in THE INCREDIBLE HULK. Ah, I've loved this word since the days of Weine's CABINET OF DR. CALIGARI. But you apply it perfectly here. This movie was unmitigated multiplex trash, with not a redeaming quality. Even the striking visuals were derivative of AN AMERICAN WEREWOLF IN LONDON. I think Mad Hatter nailed it with his last sentence, as you did with this blunt, uncompromising and superb essay. Tony, I didn't find the story muddled and uneven. It was pretty simple. Lawrence investigates death of brother. Villagers hunt beast. Werewolf attacks people. Lawrence gets bitten. Scotland Yard investigates. Lawrence goes to London in chains. Lawrence attacks London. Lawrence faces his lycanthropic pop. Beauty tries to tame beast. It's a no go. (I love the whole composition, lighting, and Gothic atmosphere of the waterfall scene.) Simple story. Action. Gothic atmosphere. I had a good time. Ah, Hokahey. You're playing word games with me. I didn't ask if you found the STORY uneven. I asked if you found the MOVIE uneven. Uneven in tone, muddled in its intent. One minute, the film is trying to be operatic and Grand Guignol like the Coppola DRACULA it ripped its score off of. Then the next, it is going for the gore like another recent werewolf film, Neil Marshall's DOG SOLDIERS. Then it climaxes with a ridiculous fight between werewolves right out of a superhero genre film (much like the silly confrontation between the Hulk and the Abomination in THE INCREDIBLE HULK). The fact that the story is so simple makes its mishandling and unnecessary "dressing up" all the more inept. Oh. Yeah, I got ya. I also don't think the movie is uneven. It is consistently dark and Gothic and full of action. Is it like other films at times? I suppose it is - but I felt the MOVIE was quite consistent and even in its enjoyable B-moviedom. I actually enjoyed this version of the Wolfman. It gave me a feeling of nostalgia for the original. I truly appreciated the make-up effects. These were Wolf MEN and not large wolves. Even after transformation they still held some human characteristics - and that is what made it so tragic.